Neurosurgical techniques are effective and underutilized for patients with drug-resistant epilepsy. Epilepsy is one of the most common neurologic disorders affecting 2.2 million people in the US. Approximately 70% to 80% of these patients achieve acceptable seizure control with antiepileptic drugs, while the remaining 20% to 30% have drug-resistant epilepsy.1 Patients with epilepsy are at increased risk of serious morbidity and mortality including cognitive and mood disorders and sudden death in epilepsy (SUDEP). Although for many patients with drug-resistant epilepsy, neurosurgery is the most effective treatment to control seizures and significantly improve quality of life,2 epilepsy surgery remains one of the most underutilized therapeutic interventions.3 The reasons for this underutilization are not clearly defined but may include underrecognition of potential surgical candidates and concerns about further morbidity from surgery. In the past decade, there has been significant advancement and refinement of imaging and surgical techniques. Although surgical resections are still the most common epilepsy surgery, the focus of this article is indications for epilepsy surgery and newer and less invasive surgical techniques and outcomes. The success of epilepsy surgery depends largely on the results of the presurgical evaluation. The overall goal of the presurgical evaluation is to identify the epileptogenic zone and to determine which surgical procedure would be appropriate and beneficial for the patient.9 The core components of a presurgical evaluation include a neuropsychologic evaluation, high-resolution structural MRI and video scalp EEG to capture and localize seizures. Depending on the clinical scenario, additional testing such as task-based functional magnetic resonance imaging (MRI), interictal F-fluorodeoxyglucose (F-FDG) PET scan, and magnetoencephalography (MEG) may be utilized. There is an overall trend in neurosurgery toward minimally invasive techniques and several improved surgical methods for achieving precisely targeted destruction of subcortical structures. 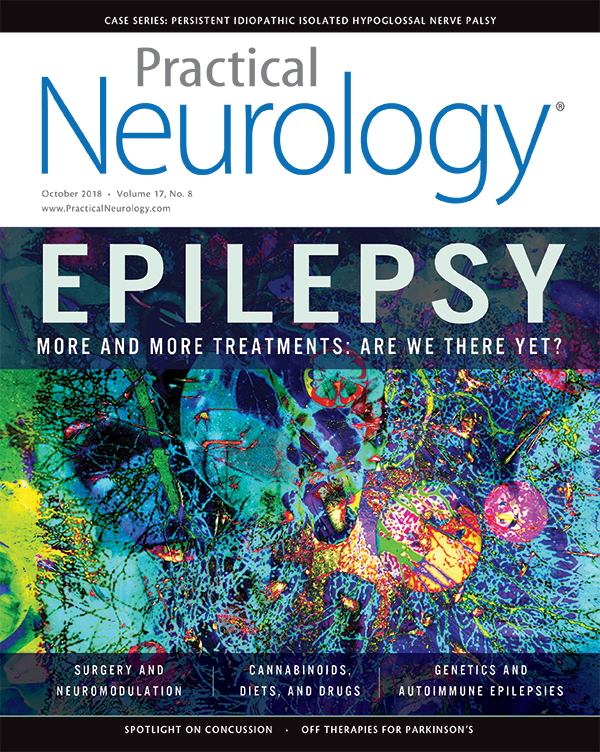 Recent advances in neuroablative techniques in epilepsy include MRI-guided laser interstitial thermal therapy (MRgLiTT), stereotatic radiosurgery, radiofrequency (RF) thermocoagulation, and MRI-guided focused ultrasound (MRgFUS). The MRgLiTT technique is rapidly becoming an accepted alternative to surgical resection in patients with mesial temporal lobe epilepsy. The procedure utilizes laser heating via stereotatically inserted optic fiber to target and thermocoagulate mesial temporal structures. The extent of thermocoagulation is regulated by a real-time magnetically guided heat-mapping and cooling catheter.14,15 Outcomes data are limited, follow-up times are short, but the initial evidence seems to suggest that MRgLiTT is a good alternative for anterior temporal lobectomy. Several case series report successful outcomes in about half of the patients.16-21 Patients with mesial temporal sclerosis (MTS) seem to have better outcomes compared to those without MTS (60% of patients free of disabling seizures 1 year after surgery vs 33.3%).21 The SLATE trial, a prospective, multicenter study of MRI-guided laser ablation in patients with medically intractable mesial temporal lobe epilepsy is currently underway. Compared to temporal lobectomy, MRgLiTT is well tolerated and is associated with fewer cognitive deficits in patients with mesial temporal lobe epilepsy.22 Craniotomy is not required for MRgLiTT, which makes the recovery period much shorter. Patients often stay in the hospital for 1 day, usually in the neurologic intensive care unit or in a standard hospital unit and are then discharged to home the day following the procedure. Most activities, including work, can be resumed in 5 to 7 days. Complications reported usually include asymptomatic visual field deficits, cranial nerve palsy, and intracranial hemorrhage (Table). For patients who undergo invasive monitoring with intracranial electrodes, the same electrodes can be connected to a radiofrequency (RF) generator for focal themocoagulation (thermolesion). Although not widely performed in the US, thermocoagulation is thought to be a safe and well-tolerated procedure in Europe.25 Multiple 5- to 7-mm-diameter thermolesions can be created by applying 100 to 110 mA bipolar current (50 V) for 10 to 50 seconds. There are several benefits to this technique. This procedure does not require additional surgery and can be performed at bedside without anesthesia. Multiple sites can be coagulated, with real-time electrophysiological feedback. However, unlike MRgLiTT, there is no real-time feedback on thermal energy delivery, with theoretical risk to surrounding structures. Limited evidence so far suggests that RF thermocoagulation can be proposed as a palliative procedure if resection is not possible. Approximately one-third of patients experience significant reduction in seizure frequency; 15% to 18% of patients achieved seizure freedom after RF in 2 case series.25,26 There were no reports of worsening seizures. Further randomized controlled trials are needed to determine the indications and efficacy of RF thermocoagulation. Another potential capability of MRgFUS is the ability to increase drug delivery to targeted brain regions through a temporary disruption of the blood-brain barrier (BBB).36 Combining sonications with microbubble agents may also enhance the increase focused bioeffects of FUS. MRgFUS is a promising noninvasive therapeutic option but needs further investigation before FUS can be translated to clinical practice. Several trials are currently underway to evaluate feasibility, safety, and initial effectiveness of MRgFUS for focal epilepsy. Epilepsy surgery can be an effective and safe treatment for patients with drug-resistant epilepsy. Although open resection still remains the standard for epilepsy surgery, early results suggest that minimally invasive surgical techniques may be an exciting and effective alternative treatment to open surgery. The potential for faster recovery time and reduced morbidity is certainly an attractive treatment option. Further larger prospective studies are needed to validate the safety, long-term efficacy, and cost effectiveness of the emerging procedures in epilepsy surgery. 1. M. Sillanpaa. Long-term outcome of epilepsy. Epileptic Disord. 2000;2:79-88. 2. Wiebe S, Warren TB, Girvin JP, et al. A randomized controlled trial of surgery for temporal lobe epilepsy. New Engl J Med. 2001;345:311-318. 3. Wiebe S. Early epilepsy surgery. Curr Neurol Neurosci Rep. 2004;4:315-320. 4. Kwan P, Arzimanoglou A, Berg AT, et al. Definition of drug resistant epilepsy: consensus proposal by the ad hoc Task Force of the ILAE Commission on Therapeutic Strategies. Epilepsia. 2010;51:1069-1077. 5. Engel J Jr, Wiebe S, French J, et al. Practice parameter: temporal lobe and localized neocortical resections for epilepsy—report of the Quality Standards Subcommittee of the American Academy of Neurology, in association with the American Epilepsy Society and the American Association of Neurologic Surgeons. Neurology. 2003;60:538-547. 6. Choi H, Carlino R, Heiman G, et al. Evaluation of duration of epilepsy prior to temporal lobe epilepsy surgery during the past two decades. Epilepsy Res. 2009;86:224-227. 7. Haneef Z, Stern J, Dewar S, et al. Referral pattern for epilepsy surgery after evidence-based recommendations: a retrospective study. Neurology. 2010;75:699-704. 8. Janszky J, Janszky I, Schulz R, et al. Temporal lobe epilepsy with hippocampal sclerosis: predictors for long-term surgical outcome. Brain. 2005;128:395-404. 9. Sperling MR, O’Connor MJ, Saykin AJ, et al. Temporal lobectomy for refractory epilepsy. JAMA. 1996;276:470-475. 10. Wieser HG. Historical review of cortical electrical stimulation. In: Luders HO, Noachtar S, editors. Epileptic seizures: pathophysiology and clinical semiology. New York: Churchill Livingstone; 2000:141-152. 11. Risinger MW, Gumnit RJ. Intracranial electrophysiologic studies. Neuroimaging Clin N Am. 1995;559-573. 12. Cardinale F, Cossu M, Castana L, et al. Stereoencephalography: surgical methodology, safety, and stereotatic application accuracy in 500 procedures. Neurosurgery. 2013. 72:353-366. 13. Engel J, Jr, Van Ness PC, Rasmussen TB, Ojemann LM. Outcome with respect to epileptic seizures. In: Engel J Jr, ed. Surgical treatment of the epilepsies, ed 2. Raven Press; 1993: 609-621. 14. Gross RE, Mahmoudi B, Riley J. Less is more: novel less-invasive surgical techniques for mesial temporal lobe epilepsy that minimize cognitive impairment. Curr Opin Neurol. 2015;28:182-191. 15. Kang JY, Sperling MR. Magnetic resonance imaging-guided laser interstitial thermal therapy for treatment of drug resistant epilepsy. Neurotherapeutics. 2017;14:176-181. 16. Willie JT, Laxpati NG, Drane DL, et al. Real-time magnetic resonance guided stereotactic laser amygdalohippocampotomy for mesial temporal lobe epilepsy. Neurosurgery. 2014;74: 569-584. 17. Kang JY, Wu C, Tracy J, et al. Laser interstitial thermal therapy for medically intractable mesial temporal lobe epilepsy. Epilepsia. 2016;57:325-334. 18. Waseem H, Vivas AC, Vale FL. MRI-guided laser interstitial thermal therapy for treatment of medically refractory non-lesional mesial temporal lobe epilepsy: outcomes, complications, and current limitations: a review. J Clin Neurosci. 2017 Apr;38:1-7. 19. Jermakowicz WA, Kanner AM, Sur S, et al. Laser thermal ablation for mesiotemporal epilepsy: analysis of ablation volumes and trajectories. Epilepsia. 2017;58:801-810. 20. Donos C, Breier J, Friedman E, et al. Laser ablation for mesial temporal lobe epilepsy: surgical and cognitive outcomes with and without mesial temporal sclerosis. Epilepsia. 2018;59(7):1421-1432. 21. Gross RE, Stern MA, Willie JT, et al. Stereotatic laser amygdalohippocampotomy for mesial temporal lobe epilepsy. Ann Neurol. 2018;83:575-587. 22. Drane DL, Loring DW, Voets NL, et al. Better object recognition and naming outcome with MRI-guided stereotactic laser amygdalohippo-campotomy for temporal lobe epilepsy. Epilepsia. 2014;56:101-113. 23. Kang JY, Sperling MR. Epileptologist view: laser interstitial thermal ablation for treatment of temporal lobe epilepsy. Epilepsy Res. 2018;142:149-152. 24. Curry DJ, Raskin J, Ali I, et al. MR-guided laser ablation for the treatment of hypothalamic hamartomas. Epilepsy Res. 2018:142:131-134. 25. Guenot M, Isnard J, Ryvlin P, et al. SEEG guided RF thermocoagulation of epileptic foci: feasibility, safety and preliminary results. Epilepsia. 2004;45:1368-1374. 26. Cossu M, Fuschillo D, Guiseppae C, et al. Stereoelectroencephalography-guided radiofrequency thermocoagulation in the epileptogenic zone: a retrospective study in 89 cases. J Neurosurg. 2015;1358-1367. 27. Quigg M, Rolston J, Barbaro N. Radiosurgery for epilepsy: clinical experience and potential antiepileptic mechanisms. Epilepsia. 2012;53:7-15. 28. Bartolomei F, Hayashi M, Tamura M, et al. Long-term efficacy of gamma knife radiosurgery in mesial temporal lobe epilepsy. Neurology. 2008;70:1658-1663. 29. Vojtech J, Vladyka V, Kalina M, et al. The use of radiosurgery for the treatment of mesial temporal lobe epilepsy and long-term results. Epilepsia. 2009;50:2061-2071. 30. Regis J, Rey M, Bartolomei F, et al. Gamma knife surgery in mesial temporal lobe epilepsy: a prospective multicentre study. Epilepsia. 2004;45:504-515. 31. Barbaro NM, Quigg M, Broshek DK, et al. A multicenter, prospective pilot study of gamma knife radiosurgery for mesial temporal lobe epilepsy: seizure response, adverse events and verbal memory. Ann Neurol. 2009;65:167-175. 32. Barbaro NM, Quigg M, Ward M, et al. Radiosurgery versus open surgery for mesial temporal lobe epilepsy: the randomized, controlled ROSE trial. Epilepsia. 2018;59:1198-1207. 33. Jolesz FA, McDannold NJ. Magnetic resonance-guided focused ultrasound a new technology for clinical neurosciences. Neurol Clin. 2014;32:253-269. 34. Ram Z, Cohen ZR, Harnof S, et al. Magnetic resonance imaging-guided, high-intensity focused ultrasound for brain tumor therapy. Neurosurgery. 2006;59:949-955. 35. Elias WJ, Huss D, Voss T, et al. A pilot study of focused ultrasound thalamotomy for essential tremor. N Eng J Med. 2013;369:640-648. 36. Hynynen K, McDannold N, Vykhodtseva N, Jolesz FA. Noninvasive MR imaging-guided focal opening of the blood-brain barrier in rabbits. Radiology. 2001;220:640-646. The author has received research grants/contracts from Johns Hopkins Hospital with Eisai Pharmaceuticals, Medtronic, and the NIH.